Constructions of Intersubjectivity shows that the meaning of grammatical constructions often has more to do with the human cognitive capacity for taking other peoples’ points of view than with describing the world. Treating pragmatics, semantics, and syntax in parallel and integrating insights from linguistics, psychology, and studies in animal behaviour, Arie Verhagen develops a new understanding of linguistic communication. In doing so he shows the continuity between language and animal communication and reveals the nature of human linguistic specialization. Professor Verhagen uses Dutch and English data from a wide variety of sources and considers the contributions of grammar to the coherence of discourse. He argues that important problems in semantics and syntax may be resolved if language is understood as an instrument for exerting influence and coordinating different perspectives. The grammatical phenomena he discusses include negative expressions, the let alone construction, complementation constructions, and discourse connectives. This powerfully argued and original explanation of the nature and operation of communication will interest a wide range of scholars and advanced students in linguistics, cognitive science, and human evolution. Readership: Linguists, cognitive scientists, evolutionary and behavioural biologists, psychologists, and philosophers interested in discourse, pragmatics, and the cognition of language, plus their advanced students. Follow the links above to go to the respective pages on OUP’s website. Below I list some other publications of mine that address specific issues in the domain covered by CoI. a Max J. van Duijn and Arie Verhagen. Beyond triadic communication: a three-dimensional conceptual space for modeling intersubjectivity. Pragmatics and Cognition. b Arie Verhagen. Shifting tenses, viewpoints, and the nature of narrative communication. Cognitive Linguistics. Using neurological tools, we test a particular prediction following from the hypothesis that clausal negation cancels inferences evoked in another perspective than the speaker’s (while morhoplogical negation (only) reverses the orientation of the scale associated with a prediate). This is an expanded, slightly revised version of the theory underlying CoI, partly in response to questions and comments I received from colleagues and students, concerning the relationship, possibly even incompatibility, between the notion “intersubjectivity” as foregrounding the sharing of knowledge and beliefs, and the idea of argumentativity being inherent to language which I defend and elaborate in the book, and which foregrounds disagreement and even rejection (cf. also negation). Here I argue that the two are really different aspects of a broad concept of intersubjectivity, each pertaining to another level in the hierarchical structure of the joint projects that constitute the ‘niche’ in which human communication takes place. It is this insight that constitutes the expansion/revision of the theory. 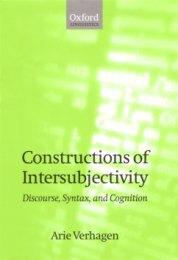 Based on the 2005 book, I discuss the character of the theoretical notion ‘intersubjectivity’, as it should apparently be construed given the way it is manifested in the structure and use of language. The discussion focuses on evolutionary implications, and the similarities and differences between animal and human communication, again: based on the linguistic analyses in the book. An overview of applications of the concept ‘construal’ in cognitive linguistics, integrating intersubjectivity into the overall picture. In chapter 3, on complementation, there is a discussion of the phenomenon that, in traditional terms, a question phrase (‘Wh-phrase’) sometimes seems to be positioned in a higher clause than the one it is a constituent of. For example, in “How do you think he solved the problem?”, “How” asks about the manner of finding a solution, not about thinking. Especially in the generative tradition, this has been taken as important evidence for general properties of grammatical structure, or even of the supposedly innate Universal Grammar. On the basis of corpus evidence, however, I argue that such utterances are licensed by an independent, relatively concrete template, having a specific function in the domain of intersubjective coordination; thus it has no implications for properties of complementation in general. This paper provides a separate discussion of this argument and the evidence, with a brief overvierw of the main theoretical points. Discusses the way the argumentative approach to (especially) the semantics of negation and of connectives may be related to problems of interpretation and translation. Explores the historic development of the ‘epistemic’ or ‘evidential’ uses of the Dutch verbs ‘beloven’ (to promise) and ‘dreigen’ (to threaten), as in ‘The debate threatened to get out of hand’. This is the first paper in which I demonstrate that argumentativity enters into the explanation of structural grammatical properties of clauses. There is a relation between word order (the two possible positions of the verbs ‘beloven’ and ‘dreigen’ wrt non-finite verbs) and the possibility of the verb allowing an epistemic sense, but this relation is asymmetrical (one order only allows one interpretation, the other order allows both), which I relate to a hypothesis about a fundamental asymmetry in semantics: all elements contribute to the argumentative value of an expression, while not all elements have to contribute to its descriptive content. Below are two publications in Dutch that cover a few of the central notions of CoI. Een inleidende beschouwing over de inherente argumentativiteit van taal, gebaseerd op de benadering van Anscombre en Ducrot, in combinatie met de ‘Mental Space’-theorie van Fauconnier e.a., zoals die m.n. ook in hoofdstuk 1 (en gedeeltelijk in hoofdstuk 2) van CoI uiteengezet wordt. Bevat o.a. een demonstratie van de algemene relevantie van het begrip ‘subjectiviteit’ en de ‘Mental Space’-benadering, aan de hand van een gedeeltelijke analyse van een gedicht van Judith Herzberg, en van de interactie tussen ontkenning en enkele connectieven (‘daarom’, ‘dus’, e.d. ).